NGDRS denotes National Generic Document Registration System, National Generic Document Registration System (NGDRS) is common configurable generic document registration software registering documents with Registrar offices of the State Govt. This project has been launched by the Government of India, Ministry of Rural Development, and Department of Land and resources as a step towards Digital India Initiative. So if you have any registration work in Goa like document registration, property registration, etc. then getting registered on this portal called ngdrsgoa.gov.in is essential to submit your application online. In this article we will discuss and explain to you on how to get registered on NGDRS Goa Portal or ngdrsgoa.gov.in, correctly. So below are the complete steps explained in brief manner which will guide you throughout on citizen registration of ngdrsgoa.gov.in Portal. To Register on NGDRS GOA Portal you will have to make sure that you have decent internet speed and a mobile or computer or laptop on which you can access the website. If you have the above requirements handy then just visit NGDRS GOA Portal by visiting //ngdrsgoa.gov.in from your web browser. 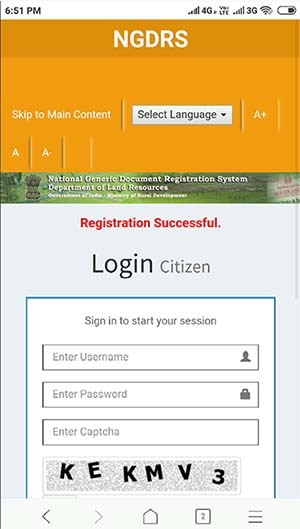 To register yourself on the portal, just click on Citizen Registration which you can see in left hand side pane. Make sure you have filled every details in the registration form correctly and click on submit button. Once you click on get otp button, you will receive one time password on your registered mobile number. That’s it you will be successfully logged into your account, now you can click on left pane and document entry option to start registering the document title. 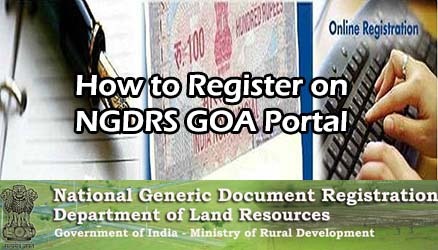 That’s it, this is how one can Register on NGDRS GOA Portal | ngdrsgoa.gov.in.